It has been suggested that this article be merged into Typographic alignment. (Discuss) Proposed since May 2013. 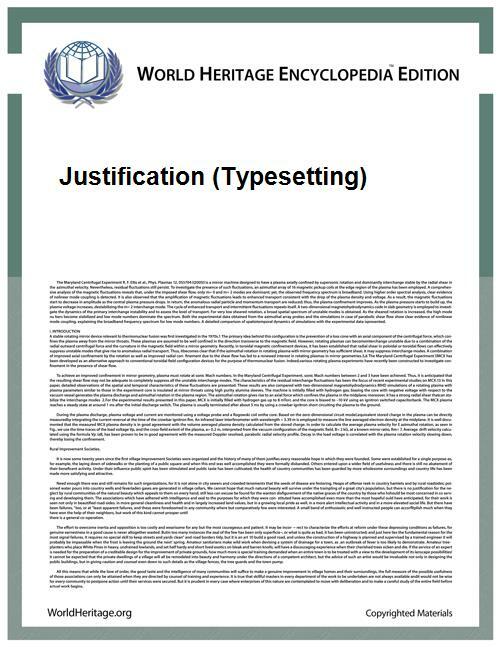 In typesetting, justification (sometimes referred to as 'full justification') is the typographic alignment setting of text or images within a column or "measure" to align along both the left and right margin. Text set this way is said to be "justified." In justified text, the spaces between words, and, to a far lesser extent, between glyphs or letters (known as “tracking”), are stretched or sometimes compressed in order to make the text align with both the left and right margins. When using justification, it is customary to treat the last line of a paragraph separately by left or right aligning it, depending on the language direction. Lines in which the spaces have been stretched beyond their normal width are called loose lines, while those whose spaces have been compressed are called tight lines. The problem of loose lines is reduced by using hyphenation. With older typesetting systems and WYSIWYG word processors, this was done manually: the compositor or author added hyphenation on a case-by-case basis. Currently, most typesetting systems (also called layout programs) and modern word processors hyphenate automatically, using a hyphenation algorithm. In addition, professional typesetting programs almost always provide for the use of an exception dictionary, in part because no algorithm hyphenates all words correctly, and in part because different publishers will follow different dictionaries. Different publishers may also have different rules about permissible hyphenation. Most publishers follow a basic system such as the Chicago Manual of Style or Oxford style, but will overlay their own "house style," which further restrict permissible hyphenation. People with dyslexia (particularly Scotopic Sensitivity Syndrome) find that justification helps with cognitive understanding. Judicious hyphenation is also reported to be beneficial for dyslexics. Word-processing software usually use a different kind of justification when dealing with Arabic texts. Using kashida, characters or glyphs are elongated instead of stretching the white spaces. The use of movable type solidified this preference from a technological point of view. It was much easier to handle and make emendations to large amounts of type that had words or syllables at the ends of lines than it was to respace the ends of lines. Its use has only waned somewhat since the middle of the 20th century through the advocacy of the typographer Jan Tschichold's book Asymmetric Typography and the freer typographic treatment of the Bauhaus, Dada, and Russian constructivist movements. Continuous casting typesetting systems such as the Linotype were able to reduce the jaggedness of the right-hand sides of adjacent lines of flush left composition by inserting self-adjusting space bands between words to evenly distribute white space, taking excessive space that would have occurred at the end of the line and redistributing it between words. This feature, known as "ragged right", was available in traditional dedicated typesetting systems but is absent from most if not all desktop publishing systems. Graphic designers and typesetters using desktop systems adjust word and letter spacing, or "tracking", on a manual line-by-line basis to achieve the same effect. Some modern desktop publishing programs, such as Adobe InDesign, evaluate the effects of all the different possible line-break choices on the entire paragraph, to choose the one that creates the least variance from the ideal spacing while justifying the lines (so as to reduce rivers), and gives the least uneven edge when set with a ragged margin.